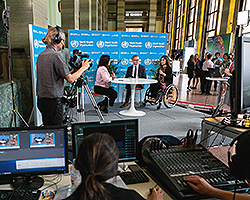 The Seventy-first World Health Assembly took place on 21–26 May 2018 in Geneva, Switzerland. Over the course of the 6 days, delegates charted a new course for the Organization. 1 billion more people are enjoying better health and well-being. Dr Tedros emphasized that, “Ultimately, the people we serve are not the people with power; they are the people with no power.” He told delegates that the true test of whether the discussions held this week were successful will be whether they result in real change on the ground. He urged them to go back to their countries with renewed determination to work every day for the health of their people. “The commitment I have witnessed this week gives me great hope and confidence that together we can promote health, keep the world safe and serve the vulnerable,” he concluded. Over the course of the final 3 days of the World Health Assembly (24–26 May 2018), debates covered a wide range of health topics. European Member States were fully engaged in these discussions. Several bilateral meetings, technical briefings and side events also took place. Digital health: Recognizing the potential of digital technologies to play a major role in improving public health, delegates agreed on a resolution to leverage digital technologies for UHC. The resolution calls for WHO to build on its existing achievements in the area of digital health, to develop a global strategy on digital health and to provide technical assistance to countries for scaling up implementation. A total of 38 delegates took the floor, all expressing strong support for the resolution. Several requested clarification of the term “digital health”, and emphasized the crucial links between digital health and health information systems, health literacy and big data. Many also highlighted the need to better clarify the private sector’s role in this area. European Member States that contributed to the discussion included Bulgaria (on behalf of the European Union), Estonia, Israel, Italy, Kazakhstan, Malta, Norway, Poland, the Russian Federation and Turkey. Public health preparedness and the International Health Regulations (IHR) (2005): Delegates welcomed a proposed 5-year global strategic plan to improve public health preparedness and response through implementation of the IHR. The IHR are an international legal instrument that is binding on all Member States of WHO. The IHR help the international community to better prevent and respond to acute public health risks that have the potential to cross borders and threaten people worldwide. The new strategic plan aims to assist countries with strengthening the core capacities they need to implement the IHR, including reporting. Dr Peter Salama, WHO Deputy Director-General for Emergency Preparedness and Response, expressed appreciation for the efforts of the countries in the informal working group, led by Australia, which has worked on the plan in recent years. Improving access to assistive technology: Delegates adopted a resolution urging Member States to develop, implement and strengthen policies and programmes to improve access to assistive technology, and requesting the Director-General to prepare by 2021 a global report on effective access to assistive technology. Assistive technology, which includes wheelchairs, hearing aids, walking aids, reading glasses and prosthetic limbs, enables people with difficulties in functioning to live productive and dignified lives, participating in education, the labour market and social life. Without such technology, people with disabilities, older people and others in need are often excluded, isolated and locked into poverty, which increases the burden of morbidity and disability. European Member States that commented included Austria, Belgium, Germany, Israel, Turkey and the United Kingdom. Rheumatic fever and rheumatic heart disease: Delegates agreed to a resolution calling for WHO to launch a coordinated global response to rheumatic heart disease, which affects around 30 million people each year. In 2015, the disease was estimated to have caused 350 000 deaths. The disease most commonly occurs in childhood and disproportionately affects girls and women. Rheumatic heart disease is a preventable condition arising from acute rheumatic fever. During the debate, the delegate from Kyrgyzstan noted the need to improve screening and monitoring of rheumatic fever and heart disease, and requested WHO support. Nutrition: Delegates unanimously renewed their commitment to invest and scale up nutrition policies and programmes to improve the feeding of infants and young children. Member States discussed efforts to achieve the WHO global nutrition targets. They concluded that progress has been slow and uneven, but noted a small step forward in the reduction of stunting. WHO is leading global action to improve nutrition, including global initiatives to make all hospitals baby friendly, to scale up prevention of anaemia in adolescent girls, and to prevent overweight in children through counselling on complementary feeding. A new report was launched on the implementation of the International Code of Marketing of Breast-milk Substitutes, highlighting that 6 more countries adopted or strengthened legislation in 2017 to regulate the marketing of breast-milk substitutes. European Member States that commented included Azerbaijan, France, the Russian Federation and the United Kingdom. Physical activity: Member States endorsed the WHO Global Action Plan on Physical Activity (GAPPA), a new initiative aimed at increasing participation in physical activity by people of all ages and abilities to promote health, beat noncommunicable diseases – including heart disease, stroke, diabetes, and breast and colon cancer – support mental health and improve quality of life. GAPPA’s goal is a 15% reduction in the global prevalence of physical inactivity in adults and adolescents by 2030. Delegates from Austria, Denmark, Germany and the Russian Federation made interventions. Preparation for the third United Nations High-level Meeting on Noncommunicable Diseases (NCDs): Member States expressed their full support for the process and preparation of the upcoming High-level Meeting, underlining the importance of having the participation of heads of state. European countries also recognized the WHO Global Dialogue on Partnerships for Sustainable Financing of NCD Prevention and Control, co-hosted by WHO and Denmark, and the high-level meeting Health Systems Respond to NCDs in Sitges, Spain, as important precursors. Delegates from the following European Member States made statements: Austria, Bulgaria (on behalf of the European Union and others), Denmark, Finland, Georgia, Germany, Hungary, Italy, the Netherlands, Norway, Portugal, the Russian Federation, Slovakia, Spain, Switzerland, the former Yugoslav Republic of Macedonia and the United Kingdom. Discussions during the final days of the World Health Assembly also covered the global snakebite burden, the Pandemic Influenza Preparedness (PIP) Framework, the Global Vaccine Action Plan (with comments from Azerbaijan, the Russian Federation and the United Kingdom) and the transition to a poliomyelitis-free world, with delegates adopting a landmark resolution on poliovirus containment. Progress reports covered communicable diseases, NCDs, promoting health through the life-course and health systems. Azerbaijan: Dr Zsuzsanna Jakab, WHO Regional Director for Europe, congratulated the Minister of Health on the country’s active role in WHO governing bodies since 2005. The meeting covered areas where Azerbaijan is requesting technical support from WHO, including health financing; this is particularly relevant in light of the country’s recent health system reform process and its piloting of a new health insurance scheme. Dr Jakab recommended that the country work closely with the WHO Barcelona Office for Health Systems Strengthening. Other topics discussed included the WHO Director-General’s planned visit to Azerbaijan this summer. Montenegro: Topics of discussion at the meeting included the outcomes of the ministerial meeting of the South-eastern Europe Health Network in Podgorica in spring 2018; collaboration between WHO and the country on immunization and NCDs; and ways to strengthen the WHO Country Office. Uzbekistan: The Government of Uzbekistan’s ambitious multipronged reform agenda was the main topic of discussion at the meeting between Dr Jakab and the Minister of Health. The country plans to introduce a health insurance system, and the Presidential Office has established a Working Commission for Health. WHO will continue to support the Ministry of Health with the development of a 5-year national health strategy and a concept note for health and development for 2019–2030. Dr Jakab plans to visit the country in November 2018. Technical briefing on the role of parliamentarians in achieving UHC and global health security as 2 sides of the same coin: This briefing, organized in collaboration with the Inter-Parliamentary Union, focused on the role of parliamentarians in improving access to quality health care for some of the world’s most vulnerable by using their influence and power to the fullest. The panel discussion shared examples of countries’ experiences of working towards UHC, with representatives participating from Austria and Kazakhstan. Participants recommended that dialogues on the topic be organized at regional and country levels. Side event on digital health: Following the adoption of the resolution on digital health, this event provided an opportunity to discuss the role of digital health and artificial intelligence in UHC, and how WHO can support countries in implementing the resolution. Panellists from both Member States and non-state actors shared experiences and lessons learned from digital health implementation.